There’s nothing like a promotion race to send football fans into a confused tangle of superstition and clinging to every spurious omen they can find. But if Leeds fans are looking for some clear signs that history might be repeating itself, then casting minds back 29 years might settle a few nerves. For Leeds fans, that’s not so difficult, given it was the last time the club were successful in this thorniest of challenges in escaping the clutches of the second tier. For Sheffield United, they have been promoted to the top flight more recently, in 2006, but that doesn’t mean their hunger for the Premier League riches is in any way diminished, and certainly won’t mean they have forgotten what happened back in 1990. In that season, Liverpool won their last top division title and Leeds were promoted from the old Second Division as champions with Sheffield United joining them in second place. A few weeks ago a repeat of all three scenarios looked on the cards, but the Citys of Manchester and Norwich have since intervened to cast a cloud on any romantic notions that this is all fated to fall neatly in to place again. 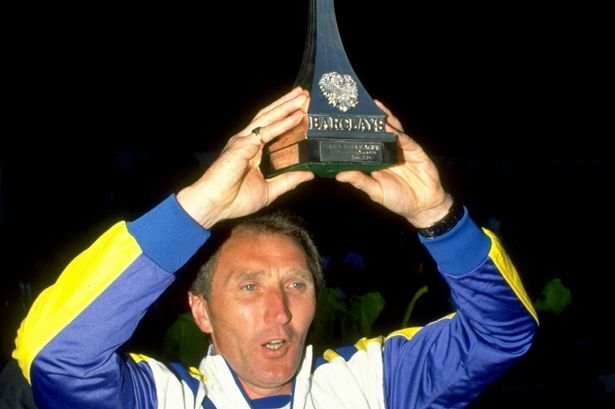 In 1990, the end-of-season showdown between Leeds United and Sheffield United had felt like it would be the decisive factor all through the campaign, but in the end it wasn’t, only ensuring Leeds went up as champions. This season’s match is the 38th of Leeds’s campaign, but in 1989/90 the Yorkshire Derby was the 42nd, and with an Easter Monday scheduling, it had a pivotal ring to it for months in advance. The needle between the two clubs had simmered all season, and while Leeds have engaged in off-pitch sparring with other clubs this season – most notably Derby County and for some reason Bristol City – the historic regional divide ensures there will always be a spiky relationship between the West and South Yorkshire camps. That said, 29 years ago, the positive bonhomie between Howard Wilkinson and Dave Bassett was an unlikely, but heartwarming, hands-across-the-water story. The odd couple of English football shared many ideologies on the game and famously lived next door to each other in a leafy suburb of the steel city. It was the perfect story for the local and national press to get their teeth into as the enormity of the Elland Road fixture became ever-more inevitable. Interest in the 2018/19 fixture is similarly intense, and equally, the two sides can barely be separated in the table. In 1990, Leeds held top spot on goal difference only, having enjoyed a healthy lead virtually all season. Indeed they went into the fixture on an uneasy run of two defeats and two draws from the previous four games. Confidence was low and they really couldn’t have met their biggest rivals at a worse time. In the end, Leeds ran out comprehensive winners, albeit the final scoreline perhaps flattered them and the nature of the game did nothing to quell the burning hostility between the two clubs. In a tight game on a typically sunny-but-blustery Spring day, the atmosphere amongst the 32,727 crowd was tense but on the edge of explosive. Gordon Strachan settled some nerves with the opening goal on 17 minutes, prodding home a loose ball from close range. The game was fractious and unglamorous thereafter, but Leeds managed to maintain control and largely kept the Blades at arms’ length. A 4-0 scoreline was the emphatic result, but the match was on a knife edge until the 74th minute when a pre-meditated tactic Leeds had worked on produced valuable dividends. Sheffield United’s prolific use of the ‘long ball game’ was based on the skyscraping goal-kicks of Simon Tracey, and Wilkinson moved to cut off the supply at source. 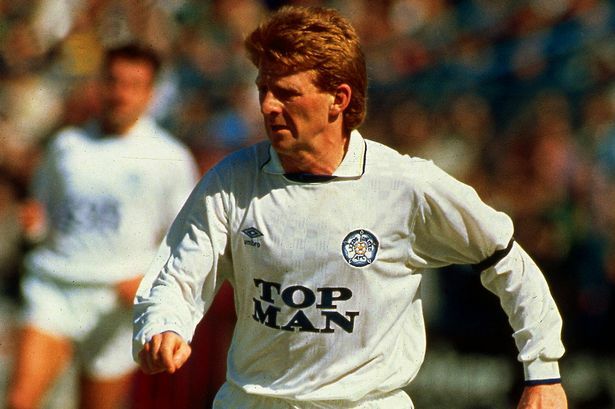 Leeds striker Bobby Davison was stationed on Tracey’s shoulder and deployed to provide a legal nuisance. He would stand still but right in front of the hot-headed goalkeeper who grew increasingly distracted by Davison’s presence all afternoon. In the 74th minute Davison turned his back to ricochet a Tracey goal-kick and eventually won a throw-in on the West Stand side. From the resulting attack, Gary Speed surged down the left wing and delivered the perfect cross for Lee Chapman to slide in and deliver a dagger to Sheffield United hearts. From there, the Blades capitulated in body and mind, particularly Tracey, who recklessly grabbed Davison and conceded a penalty after the pint-sized striker had charged down another goal-kick. Lucky to escape a sending off, a raging Tracey was left to retrieve the ball from his net for a third time as Strachan dispatched a casual penalty. The icing on the cake came in the 89th minute, when Leeds were finally able to let loose amid the tangible release of tension around a buoyant Elland Road. Chris Kamara released Gary Speed to score one of his most iconic goals, as he sprinted half the length of the field to drill a hard, low finish in Tracey’s bottom corner.